Order your Nord Stage 3 Compact 73 Key Semi Weighted Keyboard from AMS and enjoy 0% Interest Payment Plans, Free Shipping, Free Extended Warranty & 45 Day Money Back Guarantee. A fifth generation keyboard of the successful Stage series, the Compact features a 73-note semi-weighted waterfall keybed (E-E) with physical drawbars. The Compact 73 features Nord's latest award-winning technologies including the Nord Lead A1 Synth Engine with sample playback, acclaimed Nord C2D organ, a greatly enhanced Piano Section and extensive hands-on Effects - all in one exceptional performance keyboard. The Nord Stage 3 Synth section has powerful sample playback capabilities and comes with an outstanding selection of samples from our new Nord Sample Library 3.0 (coming soon). 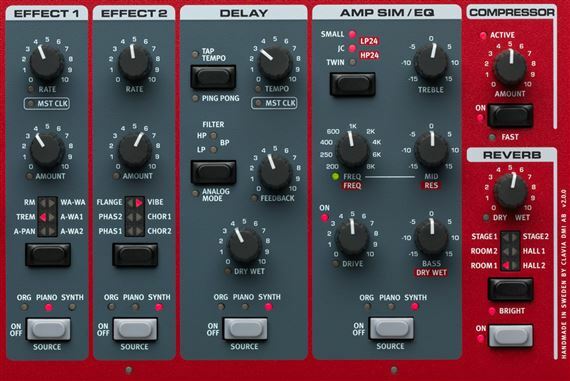 All samples can be tweaked creatively inside the Lead A1 Synth Engine and it is even possible to create and transfer your own samples using the Nord Sample Editor (coming soon). 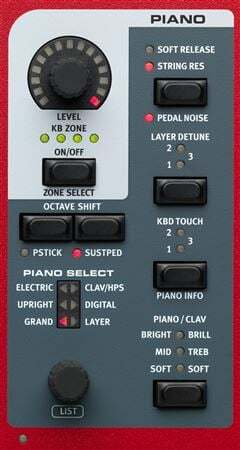 The Nord Stage 3 Compact keybed uses semi weighted organ keys with a rounded "waterfall" tip, brilliant for rapid organ shredding and synthesizer licks, but also plays nice with piano sounds. Key range E-E. Each Fatar keybed is meticulously calibrated at the Nord factory to ensure an even response over the whole range. Phone: 800.431.2609 Warranty: One Year Warranty on parts and labor. Sustain Pedal - 1/4", 6.35 mm jack. Use a momentary pedal, like e.g, Roland DP-2, DP-6, Yamaha FC-4, FC-5, Fatar VFP1-25 etc. Organ Swell Pedal - 1/4", 6.35 mm TRS stereo jack. Use a Control/Expression pedal like e.g. Yamaha FC-7, Roland EV-5 etc. Control Pedal - 1/4", 6.35 mm TRS stereo jack. Use a Control/Expression pedal like e.g. Yamaha FC-7, Roland EV-5 etc. Program Change Pedal input - 1/4", 6.35 mm jack. Use a momentary two-button pedal like e.g. Boss FS-6, Boss FS-7 etc. Can not stop playing it! Absoulutely wondrous! Absoulutely wondrous! I have a Nord Electro 4D 73, a Nord Electro 5D 73, a Nord Stage EX 88 and this Nord Stage 3 Compact 73! The others are all fabulous but this Stage 3 Compact 73 blows them all away! It is amazing. It is light and nimble, and the sounds and versatility are stupendous! I get great compliments at every gig. I also own a Hammond C3 and a Fender Rhodes. This baby is much lighter and way easier to implement and sounds just as good! This is a terrific performance keyboard. It sounds great and feels good to play. The only drawbacks are weight and the complexity of the interface. 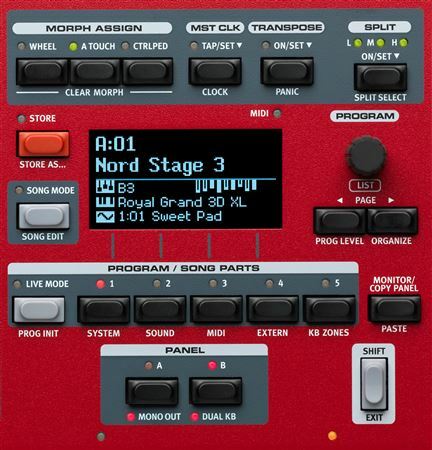 The Nord Stage 3 is a wonderful stage keyboard with all the comments to have a great show or studio session. I tour with a National Recording Artist and this keyboard give me all the sounds and programming I need to perform to my fullest potential. In the studio I am able to program all my sounds, layers, and splits. This keyboard was definitely a great investment..
Nord has become the industry standard for live performance keyboards focused on classic electromechanical and analog sounds. 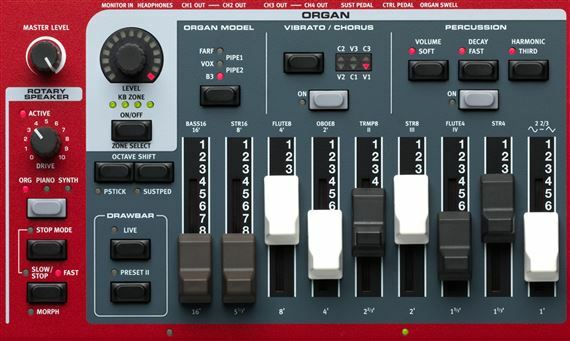 You don’t buy a Nord if you want Orchestral, Guitar or Drum sounds.....get a PC3, Motif/Montage or Kronos if you want workstation sounds! But if you want all those classic sounds in one easy to carry, intuitive package, you cannot beat this little red hottie! There are a few quirks that are not deal breakers (for me, at least) First, you cant set your own split points. Nord has them indicated by leds on the front panel by the keyboard. There is an ingenious workaround in the form of selective crossfades at each split point, however. Secondly, the pitch bend rate is fixed at 2 semitones for internal sounds. I hope this can be fixed in a software update, but, again, there is a slight workaround by assiging the oscillator control to the mod wheel. I could go on for pages about this great keyboard, but I will just say: BUY IT! Especially with AMS’ 12 payment plan! Having never owned a Nord, all I based my purchase on were the reviews, videos and word of mouth. I love the layering, the sounds, the ease of use. This keyboard is my best investment. Quality definitely shows on it. The sounds are great, plus I am able to download, add or remove sounds by hooking it up to my laptop and signing onto their website. If you have any doubts on this product, dive right in. You will not ve disappointed. Loved the fact that I was able to may payments as I play. Thank you American Musical! !